The clown costume is a perennial favorite of both children and adults. Whether for a carnival, birthday party, rodeo, or Halloween, a goofy clown is almost always appropriate. The most important ingredient of the clown costume is, of course, humor. With the exception of the scary clown, a good clown costume should spread joy and illicit at least a smile, if not a full-blown laugh. Although you can just choose a costume and go, your clown costume will be much more memorable if you select a theme. By creating a particular clown persona, you will be better able to step into character. A theme gives your clown a personality and a style. Clown themes also make choosing props, clothing, and accessories much easier. One option is the baby clown. This lovable character clown wears a short babydoll dress, usually with a petticoat or bloomers. Any color scheme can be used, but soft pastels, such as pink and lavendar, are most popular. Props for this type of clown costume can include an oversized pacifier, a doll, a large lollipop, a bottle, a parasol, or a teddy bear. This clown has a sweet disposition, but is also highly sensitive and is prone to sudden tears. The tramp or hobo clown, in the tradition of Emmett Kelly's Weary Willie, is a character down-on-his-luck. Scuffed, torn, or dirty clothes fit the bill for this popular theme. You can also turn the pockets of your over-sized trousers inside out to emphasize your penniless state. The main feature of this clown theme is a large painted-on frown. A woebegone demeanor is also important. Created in 1946, Bozo is known as "the world's most famous clown." He does, in fact, remain one of the most popular clowns of the day. Many try to imitate Bozo's trademark style, complete with wild red hair, blue-and-red costume, big red nose, and friendly smile. 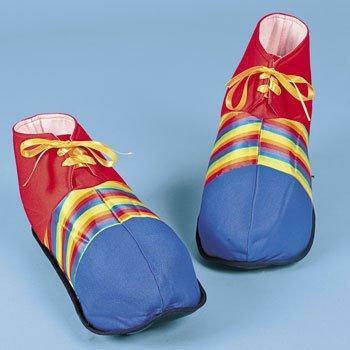 Official Bozo the Clown outfits are available at Halloween Costume Shop. Everyone loves a fairy. How about giving your fairy a clownish twist? Use wild hair in hot pink, purple, or rainbow colors. There are many short, colorful clown dresses available. Simply pick one and add a pair of fairy wings. Of course, you should also wear a tiara and carry an oversized sparkly wand. Glitter and silly string are appropriate gags for this lighthearted theme. If you want to make use of some of your old tie-dyed shirts and bell-bottoms, consider dressing as a hippy clown. Or, if you prefer to buy a costume, many shops sell outfits reminiscent of the 60s. For example, Costume Man offers an assortment of bellbottoms, go-go dresses, tie-dye prints, and funky hats. Simply add a long, straight wig in psychedelic colors, and you're ready to go!